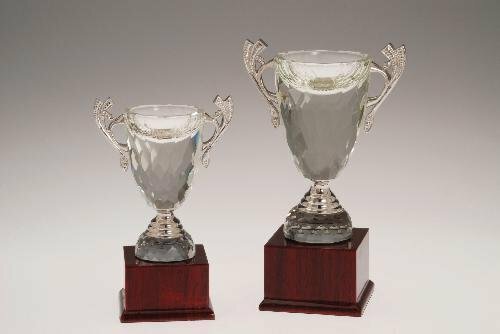 This very unique award is a modern spin on the traditional cup award. The front and back of the solid crystal is cut, beveled, and shaped to a nice flat personalization area while the sides slant outward and the crystal handles complete the illusion of a cup. The facets cut into the bottom of the cup catch and reflect color and light up through the piece for added beauty. Mounted to a black crystal base that also has room to personalize, and packaged in a lined gift box for added elegance, this handmade crystal award is a one of a kind recognition of achievement. 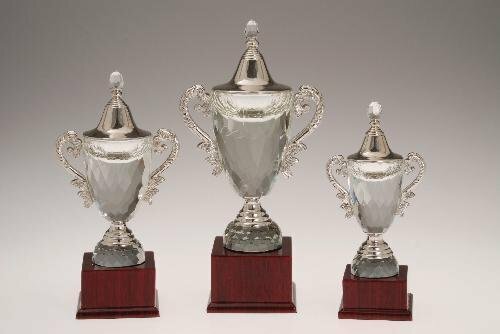 Our striking Crystal Cup with Lid Award is made of clear optical crystal, and is hand cut and polished to give it its beautiful finish. This piece is ideal for laser engraving and sand blasting, which will allow you to give it the ultimate personalization to please anyone. All of our crystal awards come to you in a Premium Presentation Box, which is lined with fabric and a magnetic catch. This item is available in three different sizes to suit various needs.